The human right to adequate housing is recognized in the international law system, enshrined in treaties already ratified by the State of Israel. The UN Committee on Economic, Social and Cultural Rights (CESCR) stresses that this is right should be interpreted broadly, so as to include the right to live in security, peace and dignity. Israel’s policy of demolishing structures in the Naqab systematically violates the Bedouin’s right to adequate housing, even in its narrowest interpretation. In the course of 2017, Israeli state authorities have demolished an unprecedented amount of 2,220 structures in the Naqab Bedouin communities in the Naqab. 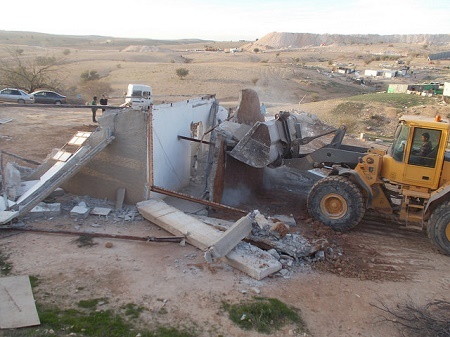 The policy of house demolitions is a violent and aggressive policy that does not build trust between the citizens and the state and cannot offer alternative solutions to those 80,000 Palestinian Arab citizens living in the unrecognized villages. The report presents updated data on the demolition policy among the Bedouin villages in the Naqab and the various trends in this policy in 2017. In addition, reference is made to the new regulations of the Planning and Construction Law and the Criminal Law, which were set in place following the Kaminitz Report and intended to toughen enforcement measures and intensify economic sanctions for building offenses. The report then goes on to describe the various enforcement authorities operating in the Naqab and the close relations between them and the development authorities. Finally, the report presents the link between the enforcement authorities’ presence in the field and the various actions that led to the dramatic increase in the number of demolitions, mainly carried out by the structures owners themselves. Photo on front page: Sign in al-Sirrah village cautioning drivers about frequent house demolitions. Source: Khaled Nasasrah. Photo on this page: House demolition underway at Umm al-Ḥīrān, February 2017. Source: Suleiman Abu al-Qian.